Consider how Miss Pettigrew’s character to be credulously out-of-touch, and that you have given it 4 stars, the book does redeem itself after all. Maybe Watson has purposefully depicts her to be so clueless so that her transformation would be more accentuated. I actually saw the movie a year ago without the knowledge that it was based on the novel until, of course, I saw the opening credit. I love how your heart strings were tugged, despite everything! I think this is to be expected in a Persephone, the non-perfection, in that, I wonder why they lapsed into obscurity unlike other books, classics which are still very much read. Being someone who mostly clicks with classics and prize-winners, I was a little reluctant to jump into a Persephone. But then I guess, that is the reason why their titles are so distinct. Certain qualities that make them worthwhile reading, despite being somehow flawed. Gems, nevertheless. I’m really excited as this will be my first Persephone, too, on Monday!!!! Hope I like it!!!! I haven’t read the book at hand so no comment there, but I understand why you didn’t have a yearly “books read” goal. Some books, like 2666 or Gone with the Wind, are a bit larger than books like Winnie-the-Pooh. How does one compare in yearly counts?! @ Matt: Yes, I did feel the book redeemed itself, although I found the beginning so frustrating that no amount of “redemption” was going to make this into a 5-star read. Perhaps you are right that Watson’s characterizations were purposeful, but I just personally felt she really didn’t hit her stride until late in the novel… I think she could have still had a rather dramatic transformation without making Miss Pettigrew so uninspiring early on. @ Claire: You know, I had never stopped to consider that maybe there is good reason why some of these Persephone titles have fallen out of favour, but I think you’re exactly right in supposing that they probably have moments of brilliance but are perhaps not overall masterpieces. That being said, I did find this a diverting read, if not as complex or nuanced as one might hope, and I think you’ll enjoy it. I can’t wait to hear your thoughts! @ Eva: I haven’t seen the movie, but I plan to. I could see myself enjoying it very much. I didn’t initially enjoy my reading of Stella Gibbon’s Cold Comfort Farm, but then I watched the movie, which was appropriately light-hearted and came to like the book more! @ Rebecca: Yes, I think it’s fine to have certain goals to strive for (read more international fiction, read more female authors, etc.,), but I see certain people with these astronomical reading goals, and I always wonder whether we should be so fixated on quantity! I mean, if you read so many books in a year, can you really enjoy them when you’re hardly spending any time with them? I wonder how people that rip through 500 page books in a few hours can really connect with them… To each her own, I suppose, but for me it’s not so much reading a lot as it is about reading enough to fulfill me and enrich my daily life! I’m sure others will be interested in this review – and you can win a book or two! @ Jackie: From your blog (and Claire’s reminders!) I was indeed made aware that this is Persephone reading week! Alas, I don’t have any more titles to read… but at least I got this one, and if this is done next year, I’ll be sure to participate properly! Great review, Steph! It’s really comprehensive and I love how you examined why you didn’t like Miss Pettigrew to begin with and then began rooting for her. Thanks, Claire! Glad you liked it, and thanks for commenting. This was definitely one of those novels that gathers steam as it goes. Awesome review! I haven’t read this book, and am a little sad to hear that it was a slow starter. 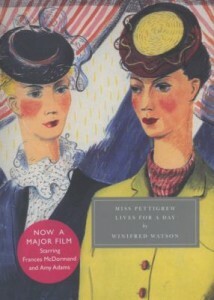 I did see the movie though, and I think that actress that played Miss Pettigrew seemed to embody passivity. I don’t know how faithful the movie adaptation is, but much of what you said in the review could be transferred to the book, so I guess it might be close. I look forward to one day reading a Persephone book, their catalog looks to be filled with some real gems. @ zibilee: We’re getting the movie tomorrow through Netflix, so I’ll be able to compare and contrast it to the book. In some ways I hope the movie is more spirited/lively, but your comment makes me think it will probably be very faithful. I will report back! I’m sorry to hear the book didn’t quite live up to your expectations, but anyway, I so enjoyed reading your review. I love that you gave me a good idea of what to expect when I get to it. And I’m glad Miss Pettigrew redeemed herself in the end! @ Nymeth: Expectations are funny things! This book wasn’t bad by any means, the beginning was just so different in tone than how I thought it would be, and I had a hard time adjusting to what the book actually was. I hadn’t actually read much about this one going into it, but had still heard about it, so I had built a very specific (but inaccurate!) idea of it in my mind… Maybe if I had snooped around and read more book reviews I would have been better prepared! At least it was still a good read even though it wasn’t what you were hoping for. I enjoyed your review a lot though, I already have this one in my pile(s) of books, hopefully I can get to it soon enough! @ Kay: Yup, I’m glad I ultimately came to like this one rather than the reverse (liking at the beginning and then not!). I think it’s a pretty hard book to hate in the end!